This Easter Recipe for Kids makes the cutest Easter treats for Easter morning! 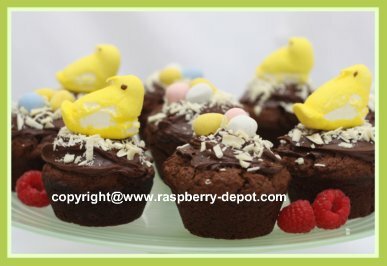 Chocolate Raspberry Muffins with mini chocolate Easter eggs and "peeps"! 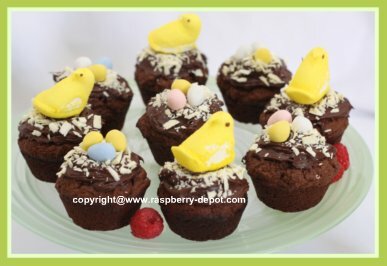 These muffins are very quick and easy to make, and will be sure to make your child smile when they find this adorable muffin on their plate for Easter breakfast or brunch! Very Easy and Fun Easter Recipe for Kids! 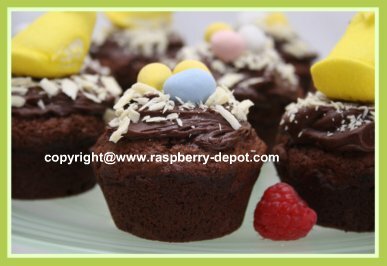 The chocolate muffins are made with fresh red raspberries, and the chocolate icing is purchased ... how easy is that? **Note - to make chocolate shavings, simply use a potato peeler to "shave" pieces, or "curls", from a chocolate square. Be sure to display your creative baking in a special way! Grease, (I used non-stick cooking spray), a 12 cup muffin pan. In a large bowl, combine the flour, cocoa, baking powder, salt and sugar. In another large bowl, beat the eggs, and then beat in the whipping cream and the oil. Make a "well" in the center of the dry ingredients, and pour in the beaten liquid measurements. Stir gently, until just combined, do not over mix. Spoon half the muffin batter into the prepared muffin cups. Place about 5 chocolate chips and 2 or 3 fresh red raspberries in the center of each, then spoon on the remaining batter. Bake at 400° F for about 20 minutes, until well risen and firm to the touch. Do not over bake. Let the muffins cool in the pan for about 5 minutes, then remove to a large plate until cooled. Using the chocolate icing, generously ice the tops of each muffin. 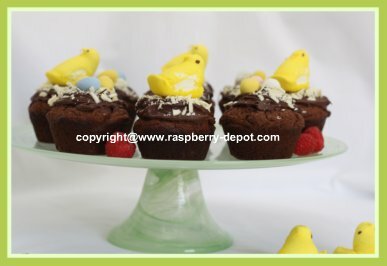 Decorate the muffin tops using the chocolate shavings, "peeps", and the mini chocolate eggs. SURPRISE your kids with these for Easter breakfast or brunch with this recipe!